I finally got around to making those red velvet cookies I saw over on Fake Ginger's blog. 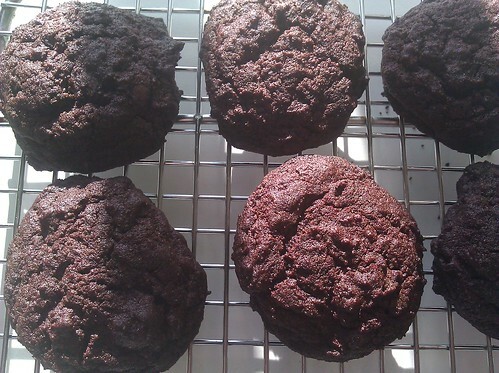 After making them today, I would call these more like devilishly chocolate chip cookies more than red velvet, truth be told, but I did really like them. I'm less excited about having ruined my manicure with the red food coloring. I made a couple of tiny tweaks to the recipe, trying to get more of a red velvety taste, and to account for the original recipe's comments regarding amount of wet ingredients. Pre-heat oven to 375. Cream the butter and sugars in an electric mixer. Mix in the egg. Pour in the cream mixture, scraping down the sides to get as much of the red coloring into your bowl as possible. After this is just mixed in, add flour mixture and mix until just combined. Stir in the chocolate chips. You will have a fairly thick dough. Use a cookie scoop to form your cookies. Bake 8-10 minutes or until cookies start to firm up. Nod, I was skeptical of a red velvet recipe that didn’t have buttermilk, which is why I added some lemon juice instead of vanilla. None of my local bodegas had any buttermilk or I would have gone with that. Next time!